Nothing! I was totally lied to an not accommodated. Everything is fantastic and the staff is super nice. Cheryl and Sharon at the front desk were absolutely amazing! They are the only reason I stayed, and the only good about the hotel. Nothing. Toilet bowl leaked. Think we stayed in a room where “tweeters” may have stayed. Smoke detector was covered with plastic. Screen was broken. Also door looked like it was broken to enter. The size of the room was nice. The first one we were given wasn’t cleaned, so we were given a second room. The gentleman at the front desk was apologetic, polite, kind and gave us an upgrade. The woman who checked me in was very polite and professional. Greeted me with a smile and was very personable. The bed was very comfortable and the staff was helpful when I couldn't get my key to work. The room was clean and in fairly good order. Just needs some freshening up. Being in the area for a tennis tournament it was within 10 minutes from where we needed to be. It was quiet at night and the A/C worked very well. There were plenty of good restaurants near by. Also close to shopping. 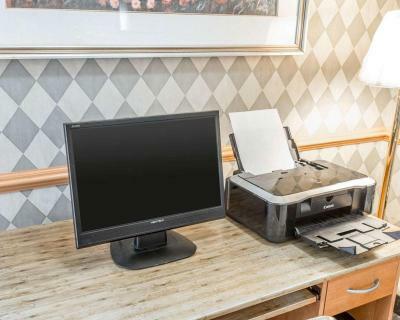 Econo Lodge Tech Center This rating is a reflection of how the property compares to the industry standard when it comes to price, facilities and services available. It's based on a self-evaluation by the property. Use this rating to help choose your stay! 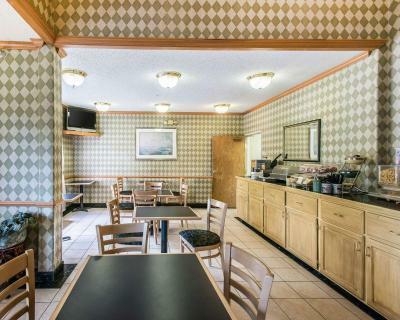 Located 4.3 mi from Denver Tech Center, Econo Lodge Tech Center features free WiFi. Free guest parking is available. A flat-screen cable TV, a microwave, a refrigerator and a coffee machine are provided in each air-conditioned room at this hotel. Each guest room includes an private bathroom with a hairdryer and free toiletries. Guests of Econo Lodge Tech Center are greeted by a 24-hour reception. Laundry facilities are located on site. Kennedy Golf Course is 7.8 mi away from this hotel. Denver International Airport is 21 mi away. When would you like to stay at Econo Lodge Tech Center? Offering free WiFi, this air-conditioned room features a flat-screen cable TV, a microwave, a refrigerator and a coffee machine. Offers an private bathroom with a hairdryer and free toiletries. House Rules Econo Lodge Tech Center takes special requests – add in the next step! Econo Lodge Tech Center accepts these cards and reserves the right to temporarily hold an amount prior to arrival. This was the absolute worst place to stay. At first sight it's nice. Then there is homeless all around the building and renting rooms smelling of drugs and just out of it. The pool was down. The room was worse, never finished water damage, The room smelled, the phone didn't work, the counters were discolored and broken, mold in the bathroom, faucets falling off, paint dripped from crappy paint job, ceiling was discolored, bed was made with what looked like old blankets and sheets, noise was terrible because the lack of respect from the druggies, breakfast was terrible we had to leave due to some tweakers already eating and touching everything and more just numerous things tiny things. We found out afterwords that they also have bed bugs.Highly recommend not staying here. Highly!!! Before making registration I called to ask if I could check in early. I work nights an needed to sleep to be able to work that night. The lady in the phone said it would not be a problem. I booked the room at that point. When I arrived an went to check in the gentleman at the counter said no check in until after 3pm. I told him I called an the lady on the phone said that it would be ok. He said no check in till after 3pm. I was upset at this point an told him how I felt about this policy an the fact that I even called first an was told there would be no problem. He then told me he could do early check in but there would be a $20 fee for early check-in. I felt that was completely wrong an not even mentioned when booking the room online or when talking to the lady on the phone. At this point I needed to find a place with a room an early check-in. I told him that I would not be checking in an that I better not be charged on my debit card. He said there would be no charge an I left. I went right up the road an was welcomed at the Stay America with no early check in fee. I will never use Econo Lodge again ever. Zero communication. I was told checkout was noon then at 9:45 room service was asking us if we wanted our room cleaned and we informed them we were staying until checkout out then not even 2 minutes later we get a call from the front desk asking us when we are leaving and if we wanted a late checkout because checkout was 11 we asked for a late checkout and they said if we wanted a late checkout we had to pay for another night so either pay or get out. The sink was filthy and any time I turned it on it would back up. I really appreciate the fact that there was a microwave and a refrigerator. A lot of hotels do not provide that in rooms. The bed and couch was also soft and comfortable. The wrinkly carpet in the hallway.